Is it me, or is this toy too much of a good thing? 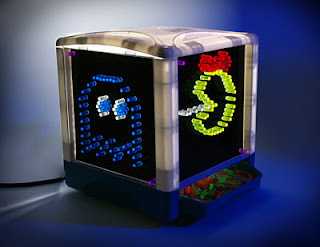 Lite Brite, the popular 70s era "game" where you used mini light bulbs to create designs. Did you have one? Feeling nostalgic? I'm not. I never had a Lite Brite as a kid so perhaps I'm just bitter that it has returned on steroids as Lite Brite Cubed. Now you have not just *one* screen for your artful masterpiece but FOUR! Is this necessary? I think not.